To help you make the most of your time in this magnificent ski area, we will be happy to help orientate you around the resort and ensure you make the most of your holiday – whether that means exploring the long gentle green and blue slopes, or covering as many of the 207 lifts and 288 pistes available as possible! It is your holiday, and Les Gets can provide the perfect ski or snowboard experience for every member of the family. For non skiiers or guests wishing to try something different there are also plenty of activities available including ice skating, paragliding, snow shoeing and day trips to neighbouring resorts and towns including Annecy, Thonon, Evian, Chamonix and Geneva. 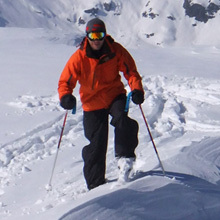 For the more advanced skiiers and snowboarders we can also arrange day trips around the Portes du Soleil to take on the challenge of the PDS tour encompassing all 12 resorts (Les Gets, Morzine, Avoriaz, Chatel, Torgon, Morgins, Champoussin, Les Crosets, Champery, Abundance, Montriond and St Jean D’Aulps) dropping in and out of France and Switzerland. You can also take on the most demanding ski run in the Portes du Soleil, known as ‘The Wall’. Starting high up on the mountain peak at the top of Avoriaz you have to quickly make solid turns around the hugh snow moguls on very steep terrain. Finishing at the bottom in Switzerland you can then celebrate with a Swiss hot chocolate, before trying your luck using the Swiss Tbar lift systems!